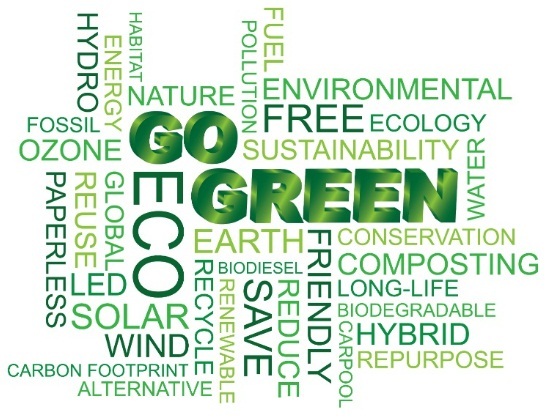 “Going green” doesn’t have to be difficult or expensive. Or boring. There are plenty of small, simple and effective ways to go green at home. Don’t waste energy heating an empty home! During the winter, set your thermostat to 68°F when at home and 55°F at night and when you’re out. If you can afford a programmable thermostat, buy one. Add insulation to your house. Doing so can save up to 30% energy. If your budget doesn’t allow redoing your insulation, at least put up thermal shades. These block the sun in the summer, and help you retain heat in the winter. Clean your refrigerator coils. A lot of dust accumulates down there, making your refrigerator work harder and consume more energy. Create and maintain a compost pile in your backyard. You can also use fireplace ashes to the compost pile. Maybe you’re already doing this but still worth mentioning – stop getting newspapers and read the news online! Use cloth napkins instead of paper napkins at the dinner (breakfast and lunch) table. instead of disposable plastic bottles, buy a reusable water bottle. Shop eco-friendly products – from beauty products to home décor. Also, avoid fragrance-less products when you can since they contain chemicals that are harmful for the ecosystem when they’re washed down the drain. Buy a new house plant. Schedule your errands in a way that you don’t have to get your car out again and again. When possible, ride a bike or take a walk. Great for the planet and your health! Repair faucets as soon as you see they’re leaking. One leaky faucet can waste up to 5 gallons of water a day. That’s 1,800 gallons in a year! Use cold instead of hot water for laundry. Use insulated lunch bags instead of plastic or paper ones. And since we’re on the topic, use organic food whenever you can – it’s not as expensive as you may think. If you have a pool, keep it covered when not in use. This not only keels the water cleaner, but minimizes evaporation, saving water. You can still uncover and show it off when you have guest or having a party! Use green household cleaners. They not only reduce air pollution, but also minimize exposure to asthma and allergy triggers. Consider the habit of removing shoes when entering your home. It will keep the nasty outside stuff like chemicals, car exhaust and pesticides from invading your home. Reduce the use of pesticides and bug sprays. Take the preventive route – keep your kitchen (and other rooms) “crumb-free” and as clean as possible. Replace all (at least some) of your regular light bulbs with CFLs. Minimize the use of bulbs and other lights. Draw the curtains and use natural light during the day! Reuse old glass jars and other containers. Pay your bills online. It’s not just green but hassle-free as well. So there you go. Simple and effective ways to go green at home. If you follow even half of these, you’ll be doing a great job caring for your planet, which is our biggest ‘home’ after all. Good luck!